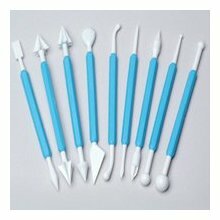 9-Piece/18 Shape Sculpting Tool Set : Use Sculpting Tool Set to form, shape, mark and imprint sugar paste flowers, leaves, figures, and other decorations. Add detail and bring your sugar paste creations to life. Instructional booklet included.